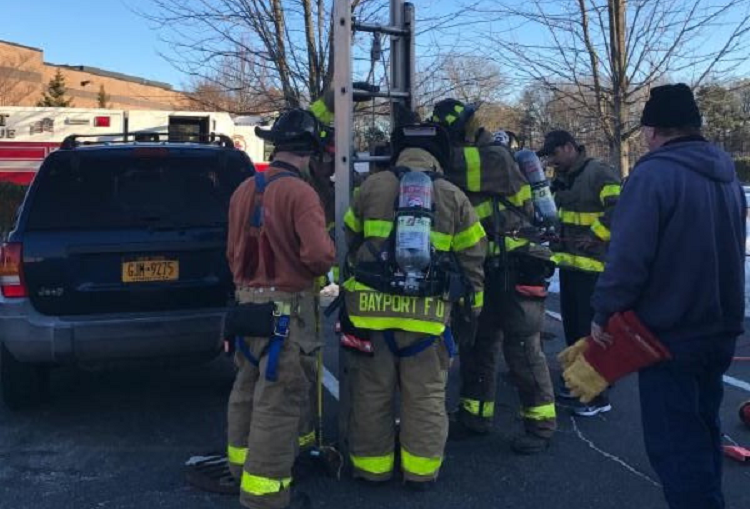 Concerned employees from Vitamin World, 10 Vitamin Drive, Bayport contacted the Bayport Fire Department on February 17, 2017 with reports of a cat 25 feet below in a storm drain. Firefighter Chris Gallo descended into the storm drain for a confined space rescue and was able to safely free the cat who was uninjured although he was bitten by the cat several times. Bayport, NY - February 18, 2017 - Concerned employees from Vitamin World in Bayport contacted the Bayport Fire Department on February 17, 2017 with reports of a cat 25 feet below in a storm drain. The Bayport Fire Department contacted the Suffolk County SPCA for assistance. Members of both agencies responded to the location at 2:30 PM. SPCA Humane Investigator Jennifer Pape put food down through the drain cover and the starving, trapped cat immediately began to eat the food. Bayport Fire Department Assistance Chief Jerry Dietz arrived at the location followed by two fire trucks and approximately 15 firefighters. Firefighter Chris Gallo descended into the storm drain for a confined space rescue and was able to safely free the cat who was uninjured although he was bitten by the cat several times. The firefighter was transported to a local hospital for treatment. Subject: LongIsland.com - Your Name sent you Article details of "SCSPCA and Bayport Fire Department Come Together and Rescue Cat Trapped in Storm Drain"